Another famous and talented, redheaded actress may now be in the mix to play Poison Ivy in the DC Extended Universe. The Harley Quinn spin-off movie Gotham City Sirens is currently being developed and is said to feature both Poison Ivy and Catwoman alongside Margot Robbie as Harley Quinn. Now it seems like Oscar-nominee Jessica Chastain may be interested in taking on the role. But she has some requirements in order to seriously consider doing it. The actress recently spoke with Cinema Blend while promoting her latest movie The Zookeeper's Wife. 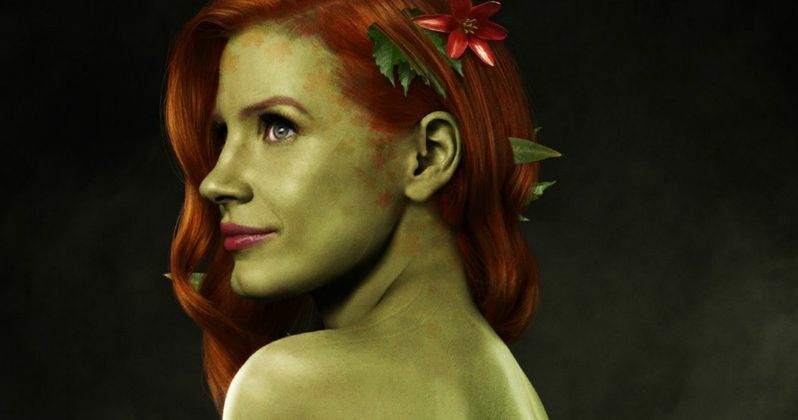 During the course of the conversation, Jessica Chastain was asked if she would be up for playing Poison Ivy in Gotham City Sirens. Her response wasn't overly enthusiastic, but she is at least open to the idea. Here is what she had to say about it. Poison Ivy is definitely a character that could run the risk of being overly sexualized on screen. Not that Warner Bros. would want to take any cues from Batman & Robin, but that was definitely how Uma Thurman played the character in that particular movie, which is the last time we saw her in a live-action movie. There were even many people online who criticized the portrayal of Harley Quinn in Suicide Squad for similar reasons. That said, there is also an opportunity to have Poison Ivy be exactly the kind of character that Jessica Chastain says she is interested in playing, so her level of interest would all depend on the take in Gotham City Sirens. As it stands, Suicide Squad director David Ayer has been tapped to direct Gotham City Sirens with Margot Robbie producing. She reportedly willed this project into existence, which came as a result of her interest in some of the other female DC Comics characters while doing research for Suicide Squad. Geneva Robertson-Dworet is writing the movie for the studio, so she will have a lot of influence over how Poison Ivy and Catwoman are ultimately portrayed. Other actresses that have been thrown into the mix for the role of Poison Ivy included Megan Fox and Mr. Robot star Stephanie Corneliussen. There also seems to be a lot of support for Emma Stone, but she hasn't expressed interest in the part, at least not publically. Warner Bros. has yet to set a release date for Gotham City Sirens, but since The Batman has been delayed, the studio may shoot the movie sometime this year. Assuming the project is far enough along in the development process to make that happen. No official plot details have been revealed, but director David Ayer recently teased that Black Mask may wind up being the villain in the movie. The Gotham City Sirens movie already has people's attention, but adding a talented actress like Jessica Chastain to the cast definitely wouldn't hurt anything.